Are you familiar with the term emergency fund? Or even, have you never heard at all? Well, simply, an emergency fund is a fund that can later be used to cover the risks of various things that have never been predicted before, or in other words for urgent needs. 1. The cost of healthcare and hospital which is quite a drain on earnings. 2. Home repairs or damage to the vehicle. 3. The right to education. 4. Other purposes are purely incidental. The more it gets worse again, when one day you lose your job makes you lose income for some time. This is an emergency fund that can help you meet a variety of needs to remain until new income allows obtaining. 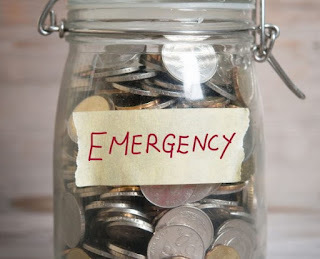 An emergency fund is the amount of funding that is capable to cover any unforeseen expenses. Therefore, it is very important to set up an emergency fund from now on. In fact, you are not recommended to save or invest before having an emergency fund is ideal. You will never know if you suddenly have to spend substantial funds to cover unexpected incidental needs. You also never know when all of a sudden you get sick, lose your job, or are there in a situation where you have to pay the Bill but were no income at all. Well, the emergency fund can protects you from unwanted consequences such as loss of home, or forced to go bankrupt. An emergency fund should ideally be able to help you out of the situation without having to rely on credit cards or loans with high interest involved. Thus, how big is the ideal emergency fund that you must have? Well, everyone has a need for an emergency fund, appropriate marital status, number of children, spending per month, as well as the pattern of income. 1. Single or without dependants at least has an emergency fund of three times of monthly expenses. 2. Small families with two children are advised to have an emergency fund of at least 6 – 9 x monthly expenses. 3. Large families with three or more children should have an emergency fund of 9 – 12 x the amount of spending. So it doesn't hurt to have an emergency fund, because this is not a fund which has to be paid each month or year. Emergency Fund must be owned at any time, and also the adjustment should not be added unless there is a change in the monthly expenses. For example, emergency funds unused this year, you do not need to add it be doubled in the next year. The fulfillment of the Emergency Fund also does not have to be done at a time. You can collect it within one to two years. But don't forget, the emergency fund must remain a priority. After knowing the amount of emergency funds you need, you must be able to tell which situation is urgent and which is not. The urgent situation is something that is related to your health or ability to earn income. So, what are the situations that are not urgent? 1. Vacation, birthday celebration, or other things to entertain yourself or partner. 2. The opportunity to get good bids for something that isn't actually you need, e.g. clothes with an enticing discounts. 3. The expenditure that is not sudden, like car insurance. When saving for an emergency fund, not to be confused between the urgent need and other things. This is important so that when the Emergency Fund has been reached, you will not be wearing it for the real thing doesn't really matter. You can open another bank account to other items such as car care, vacations and clothes. Well, now you know already what it is an emergency fund, the importance of having an emergency fund, and how much quantity you need emergency funds. Have an emergency fund or reserve fund can be saved you from short-term financial storms or risk prolonged debt trapped.